Okay, so you're ready to get back to a normal schedule, kids go to school, you go to work or get your work done around the house, but apparently mother nature isn't cooperating! Backed up to the end of the semester, teacher work days, a weekend, and Martin Luther King, Jr. Day it feels like another Christmas Vacation, only without all the new toys and gadgets and holiday gatherings. So who's ready to pull their hair out? Today was the first day when I thought "Wow, what am I going to do?" My four year old son was literally bouncing off the walls as soon as he got up this morning. And rather than listen to my 22 month old screech and yell, "Fop!" (her word for stop) all day, I decided to keep them busy. Here are a few things you can try to keep your kiddos from arguing, destroying the house, and causing other mischief. These are very easy and very time consuming for children to decorate (I promise). Also, you probably have all of the ingredients. Just make your favorite sugar cookie recipe. I used Martha Stewart's Sugar Cookie Cutouts. If I'm being honest, they came out a little crunchy and I prefer a chewier cookie, but my kids didn't have any complaints and I guess they kind of need to be crunchy to maintain their shape. My son loved rolling out the dough and cutting the cookies out. (I used a heart shaped cookie cutter for the snowman body.) After baking the cookies and letting them cool, we spread white cookie icing on the hearts and placed a giant marshmallow on the pointy part of the heart for his head. We used red icing for the scarf and black for his face and stick arms. We also used mini M&M's for buttons and the nose, but I'm sure any small candies would do the trick. At about 10 a.m. I needed a way to get some of my son's energy out. I originally tried to find a kids exercise video (PE teacher I am not) but wound up just turning on Pandora Toddler Radio and letting my kids jump around and dance. We did the Hokey Pokey, acted out 5 Little Monkeys, and laughed a lot. With a high in the lower 20s and young children this had to happen in small quantities like 20 minutes at a time. My four year old son, loves to "work" on a "job" so he worked with my husband to shovel the driveway today. I hope that he will love to shovel the driveway as much as he did today when he's a teenager. (My daughter and I watched from the warm house). It's like ice cream, but made with snow. To be truthful I had never even heard of this until yesterday when my neighbor was talking about it and then I saw three or four posts on Facebook last night referencing Snow Cream or Snow Ice Cream so I had to try it out. For snow cream you simply blend together 4 cups of very clean snow, 1 cup of milk, 1 tsp of vanilla and 1/4 cup of sugar. The finished product resembled frothy milk and did not make for an impressive picture, I'm sorry to say. It tasted like thick sweetened milk, think flavor of a vanilla milkshake, but texture of milk. My kids loved it and gulped it down, which is the most important thing. This is one of my favorite things for my daughter to do. It looks messier than it is because the shaving cream actually disappears as they play. I love watching her explore different textures with her hands. She plays on her high chair tray, which makes clean up even easier, but for my son I put the shaving cream on the inside of the lid of a large plastic tub. I'm not sure what shaving cream does to the wood finish of a kitchen table and quite frankly I don't want to find out. I know its fine on plastic surfaces. For him, shaving cream is a great tool for practicing making letters. He wrote his name and drew smiley faces and lots of squiggles. Use cotton balls, white paint, paper scraps and markers to create this cute little guy. For full directions check out my blog post "Let It Snow, Let It Snow, Let It Snow." Hide-and-Seek is really fun with a four year old! Although they don't always give you quite enough time when counting. My son kept skipping numbers so he could come find me faster. Also, it's soooo funny because they think they have the perfect hiding spot, but you can hear them shut the door to the closet they are in or see them peek out from under the bed or best yet hear them giggle as you walk by. It's also a great way to practice number skills such as counting to 20. Okay, so let me preface this one by saying, if you're trapped indoors maybe you don't want to make cookies and snow cream and snowman soup all in one day. But this one is great for just after you come in from some cold snow play. Simply make hot chocolate and stir in marshmallows and a few chocolate chips with a candy cane stirrer. Mmmm, the perfect cold day treat! Come on, you knew reading a book had to be on the list, right? 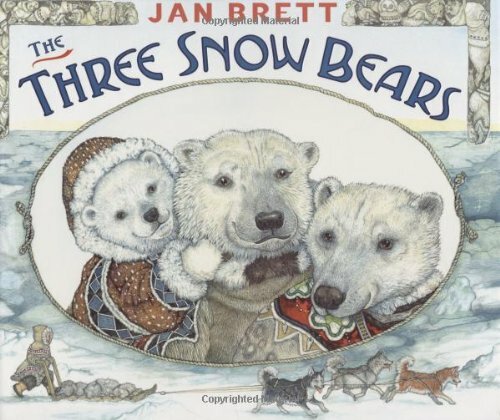 The Three Snow Bears is one of my favorites (of course). Jan Brett has a knack for changing a familiar storyline into something unique. When I share this book with a new class I always ask my students to make a text to text connection by asking them what story this reminds them of. Read it to your kids and see if you can guess what story she's retelling. Whether it's playing kitchen or store or pirates, my kids LOVE when I play with them. Sure I have a gazillion things to do, but they're only little once and I can always finish my report cards while they're sleeping or on the next snow day.